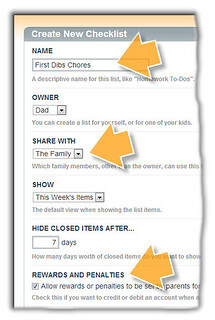 Lots of parents ask us about the best way to set up an online “first dibs” chore chart system for the kids in their family. I’d like to create a chore checklist that is open to all of my children, and the one to check it off first gets the money associated with that chore. Is that possible? For example, if the trash needs to be taken out and child 3 does that, I would like for him to be able to check the box and get the money. Yep, we can do that in FamZoo. Here’s how you set it up. 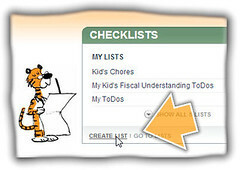 First, create a new checklist, give it a name, and share it with the whole family so that each of the kids can see it when they sign into FamZoo separately. 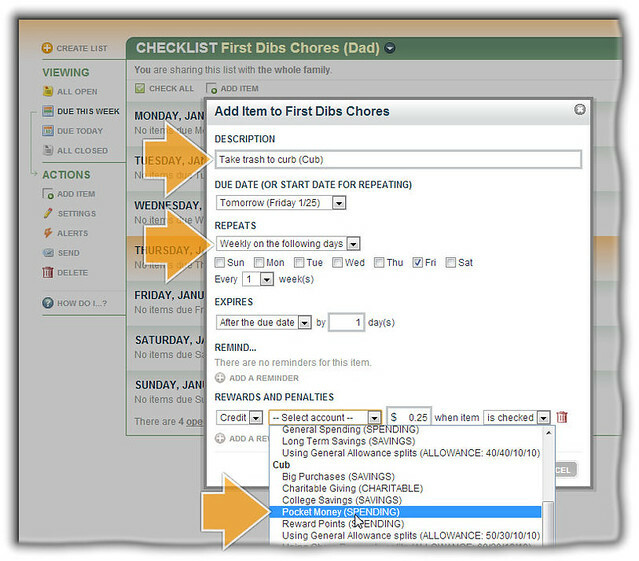 Be sure to check the Rewards and Penalties option on the list to enable the assignment of payments for each chore. Currently, chore payments must be assigned to a specific child’s account up front, so you’ll need to create a chore item for each eligible child. 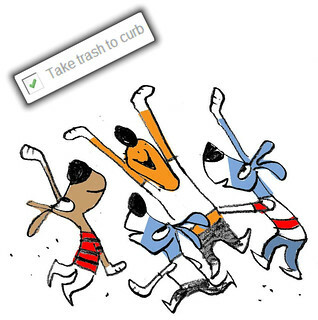 Notice how we include Cub’s name in the description of the chore. Now, we’ll add another item that’s identical to this one except we replace Cub’s name in the description with “LilSis” and we pick LilSis’ spending account instead of Cub’s. Rinse and repeat with BigSis to create a third and final item. The first kid to do the chore checks off their item to get the reward. 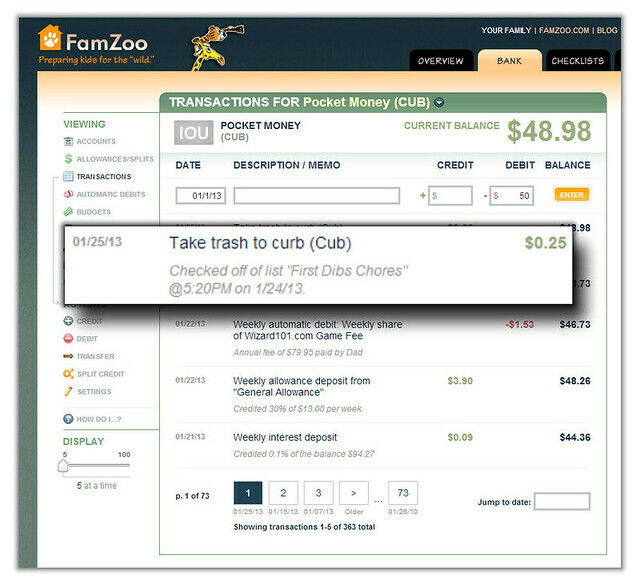 Checking off the item automatically makes a payment of the designated amount to the appropriate child’s account. If a child accidentally (or not so accidentally!) checks off an item, just un-check it to automatically reverse the payment. Do not delete the checked item because leaves any existing payment transactions in place. 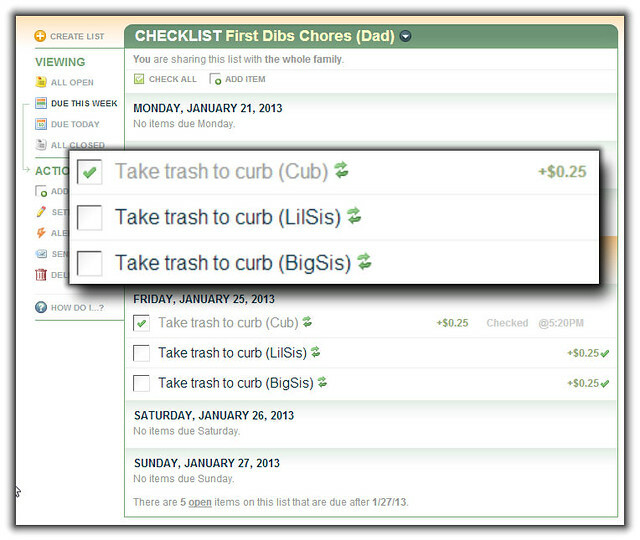 So, that’s how your create a first dibs chore chart for your kids in FamZoo. Questions? Comments? Don’t hesitate to contact us. Note: We plan to make this even simpler to set up in the future by assigning the payment account on the fly based on which child checks off the chore. That way, you’ll be able to have a single item for each chore that’s up for grabs. by Bill Dwight on Sunday, January 13, 2013 at 6:01 PM | LEAVE A COMMENT! I stumbled across a neat service this weekend that allows you to present your combined social media stream — Facebook, Twitter, your Blog, etc. — in an appealing visual way. It’s like a running gallery of attractive sound bites. The service is called RebelMouse. You can see the FamZoo social media stream on this page. If you’re visiting this post in your web browser, your should be able to see our stream embedded below as well. What New Year’s resolutions have you made in the parenting department? How about teaching your kids good money habits? Money management is a set of life skills that needs to be taught throughout our lives, from 5 to 105. In other words, start early and don’t stop! Parents actually have the primary responsibility for teaching these skills. What better place to teach about money than in the “economic unit” of a family. I believe parents are in the best position to educate their children. We believe a parent is a child’s best mentor. As a parent, you are in the best position to teach your children many of life’s most important skills. Nobody knows your kids and your family values like you do. You want the best for your children, and they naturally look to you for structure and guidance. We’re here to help you be the best mentor you can be. As educators, we also know that in-class learning can only take our financial education so far; learning by doing is a key element of anyone’s financial education. This is where parents come in as teachers, coaches and role models. By all means, don’t make the mistake that Mary’s parents made in the second article below. Since they considered discussions about money to be "vulgar," they never discussed money matters with Mary as a child. Furthermore, they never even allowed her to handle money. Not surprisingly, Mary had money issues as a young adult. Be involved as a parent. Give your kids hands-on practice. Need help getting started? Check out the 12 mom money rules in the second article. You might also check out my 3 simple tips here. To help implement your money rules, you might resolve to set up online bank accounts for your kids like New York Times writer Ann Carrns describes in the third article. I applaud Ann’s effort, but to make things more hands-on and engaging for the kids, I recommend a virtual family bank approach instead, or perhaps a teen prepaid card for the older kids. All that said, don’t spend too much time agonizing over which precise rules and tools are best. 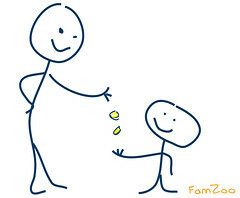 The most important thing is to resolve to start teaching your kids good money habits through hands-on practice in 2013. Then, follow through with your resolution going forward — fine tuning as necessary along the way. Your kids will thank you...someday. I love what John Farrell, Assistant Dean at Rider University, has to say in this interview about the role of parents and schools in teaching kids about personal finance! Three moms share their top money rules for their kids. It’s very interesting to see how the diverse childhood experiences influenced each of the Mom Money Rules. It’s important to see that affluence does not guarantee money savvy behavior; communication and hands-on practice with personal finance from an early age is critical. The 12 rules are split into 4 buckets: 3 individual sets of rules from each of the moms followed by one set of common recommendations. I don’t actually see any inherent contradiction in any of the 3 individual sets of rules. I’d encourage parents to apply elements of all 12 in their own way. Ann Carrns writes in the NY Times Bucks blog about her resolution to use ING sub-accounts for tracking allowance for her daughters. I certainly applaud Ann’s resolution to systematically work on good money habits with her daughters each week, introduce them to the concept of online banking, and teach the very important lesson that a balance amount on a screen corresponds to real money. Whether we like it or not, our kids are entering a world increasingly dominated by electronic transactions. While a good starting point, a piggy bank or sock drawer with wads of cash does not prepare them adequately for that reality. I think sub-accounts are a fantastic banking feature — a great way to take the “envelope budgeting” approach to personal/family finance online. Ann may still wish to check out the “virtual family bank” services that her colleague, Ron Lieber, mentions in his article because they create a much more hands-on experience for the kids. Kids can sign in on their own to see their own funds, make/track savings goals/plans, get weekly statements, review their spending history, make simple budgets, etc. They feel a real sense of ownership and responsibility that way. Parents can set up more flexible incentives/financial arrangements beyond simple recurring transfers (chore charts, matching, parent-defined savings interest rates, “commission” plans, automatic bill pay for shared expenses like cell phone data plans, loans for big ticket “needs” like computers for school, etc). A virtual family bank is really identical in concept to what Ann is doing at ING except that the kids are more directly engaged, personal finance learning tools are built-in to the experience, and parents are in complete control of the bank “rules”. Some parents still use an ING sub account in conjunction with our virtual family bank IOU accounts so they can be sure they have the money on hand when their child needs to make a purchase. In the first half of this year, we’ll be introducing an integration of our virtual family bank accounts with prepaid card accounts to make that blended approach even more convenient. We’re constantly scouring the Internet looking for articles related to family finances and teaching kids good personal finance habits. You can visit our ever growing list of family finance bookmarks here. We’re up to 3,068 now!